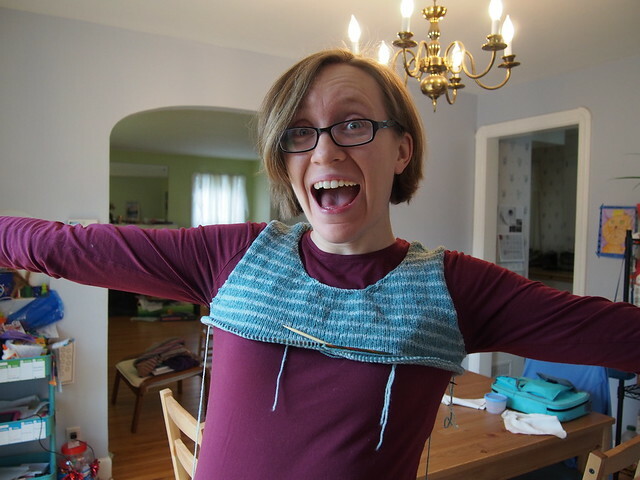 I’ve made it past the underarm join on my project that needs a better name, and that means I can try it on as I go! 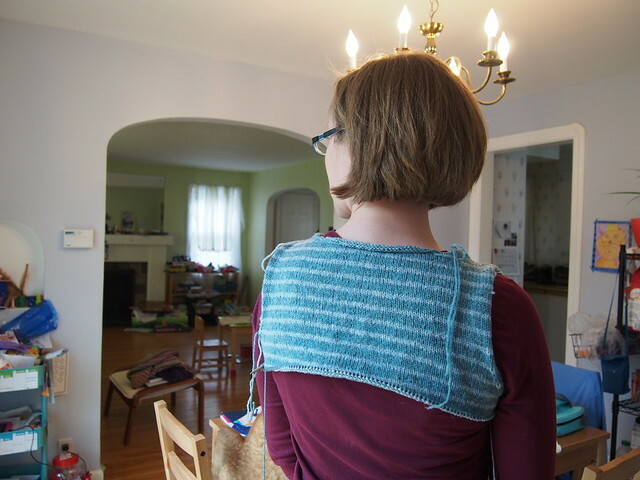 I’m planning to give the sweater a slight A-line, so that it gradually flares out to the hem, which I’m planning to have hit at the mid-hip (or perhaps a bit higher; I know I want the back to be slightly longer than the front). I planned on just a very small amount of ease at the bust, and there will be more ease lower in the body. 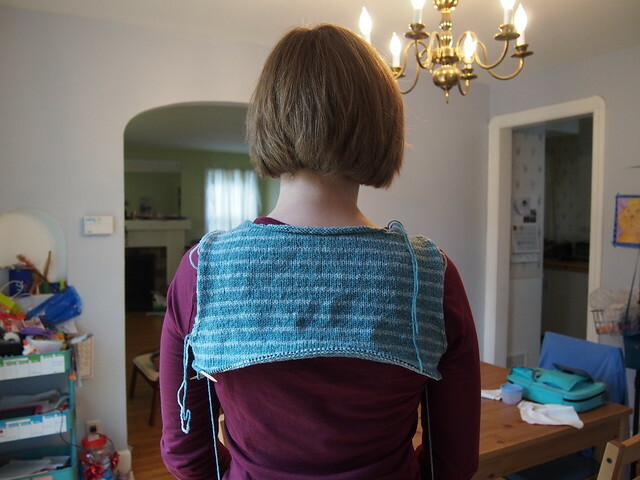 In one sense, the knitting has become much easier now that I’ve joined the front and back – I don’t have to pay nearly as much attention to increases and whatnot, and there’s no purling! 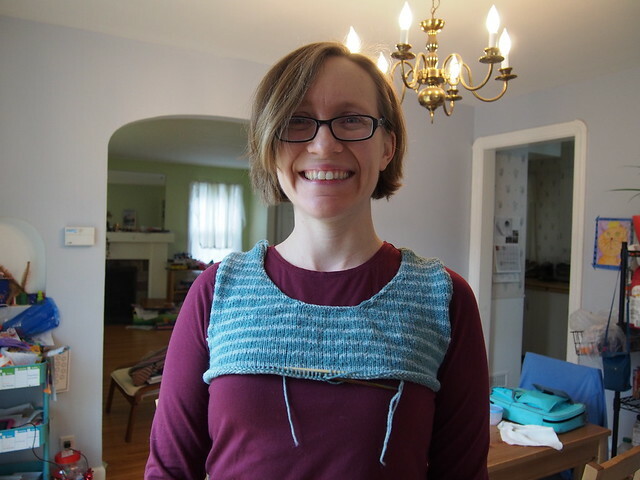 (Well, that’s a lie – I put a single purled stitch in each side “seam” just to give it a little bit of structure, and to have a fairly inconspicuous spot to “hide” the join since I’m knitting stripes in the round.) But it definitely takes a lot longer to make noticeable progress now that I’m knitting the full circumference of my body! Still, stripes have a very addictive quality for me (which might be why I knit them so much, though I also like wearing them). If I’ve just finished a wide stripe, I think, gosh, it wouldn’t take so long to just knit another narrow stripe, and then when I finish that, I think, well, I should at least get myself started on the next wide stripe, and before I know it I’ve knit several stripes. 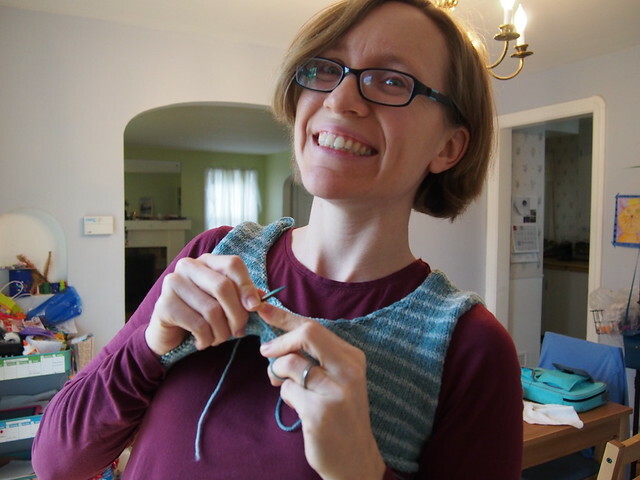 I’m not sure how much more progress I’ll be able to make before my time for knitting shrinks during the semester, and I don’t want to neglect M’s Octopus cardigan, either…both the Beaverslide yarn and the Ulysse are so delightful to knit with! In any case, for now I’m just delighted that my sweater really is fitting!